There are many misconceptions concerning which foods to eat and which to avoid when you have lymphedema. Some people recommend steering clear of sodium, others say protein. Some people even say to reduce fluid intake! What’s a lymphie to do!? 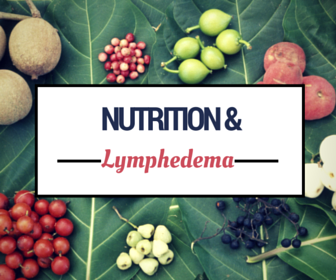 Have no fear – I’ve done a little research on the topic of nutrition and lymphedema and made a list of some quick facts and tips on how to treat your lymphedema by watching what you eat. Remember – I’m no doctor, so please do your own research if you have any questions or doubts. First things first: there is no special meal plan that will make your swelling disappear or go away. However, there are certain eating habits that you can practice to promote good health, control your swelling, and help your body manage the stresses related to lymphedema. Lymphedema is associated with the collection of high protein fluid in the tissue spaces – however, the high concentration of protein in lymphatic fluids has no connection with the protein-rich food you consume! Eat a balanced, healthy diet that includes whole grains, fruits and veggies, and fish – a healthy diet maintains the body’s immune system, which helps prevent and treat infections! Sources used for this post were Living with Lymphedema at Cancer Supportive Care Programs, Nutrition and Lymphedema and Salt and Lymphedema at LymphNotes. Wonderful post Alexa! “What should I eat?” was one of the first questions I (and my parents) asked when I was diagnosed, but my PT and doctors all just shrugged their shoulders and said “Good luck with that!”. I went vegan six months ago for ethical and environmental reasons. During that time, I was getting my leg wrapped. I don’t think it’s a coincidence that the largest reduction in my leg occurred about a month after changing to a vegan diet! I understand it’s not a possibility for everyone (economic, lifestyle, and other reasons), but I’d recommend it to anyone with a chronic condition looking to eat cleaner and greener! Hi Aria something similar happened to me, I changed to a wholefood plant based diet and it has had a huge positive effect on my lymphoedema. What do you eat? it seems when I eat carbs, my arm swells up more! I too, ethically have a difficult time giving my money to folks who cruelly farm animals. I started this simple plan weekly, and cheat with wine and beer and a bit of snacking on weekend-I have baked apple with slow cooked oatmeal, or pasture raised eggs and kale for breakfast. Lunch and dinner are salad: greens, radishes, broccoli, etc, I add wild sockeye salmon to a meal, or a hard cooked egg if it was an oatmeal morning. 3 meals, one snack-veggies like cut peppers and hummus, or celery sticks and tbs peanut butter w herbal tea. I tried it Mon-Thurs one week and felt GREAT so I continue. My belly was flat, and that’s where I swell from lymph node removal- NO DAIRY. no whey nor casein-I’m strict and for me, I see a huge difference. Hi, I too have changed to a vegan diet, but I have also cut out alcohol, nuts, gluten, fructose and Salt. I have never felt healthier and my swelling has reduced. I would definitely recommend clean eating to manage the condition! I developed Lymphedema all over after a partial hysterectomy. I too have been looking for a good diet; I figured out that I am allergic to certain foods and that contributes to my swelling. I am VERY allergic to tree nuts; non organic soy is cross bred with hazelnuts; so when I started eating soy I ballooned. Gluten does too. Dairy is bad for anyone with Lymphedema; it causes mucus buildup (this does not include yogurt or kefir). I find eating complex carbs, bean protein, whey protein, vegetables and fruits work best. I do eat meat, but try to only eat grass fed varieties; same for my whey. Michelle, I do’t know how I got connected with you, but thankfully, a message about lymph. and diet came to me. I too avoid dairy, and I find a grass fed protein, (non-whey) smoothie in am, then shrimp and greens for lunch, salmon and broccoli dinner keep me lean. I try to stay on this type of plan Mon-Fri. I exercise everyday. I’m post secondary-I have full hysterectomy due to cancer tumor. Lets stay in touch. I’m in VA-where are you? Hi Debra, Thank you for your response; I would like to stay in touch. I’m in NM. I have Primary Tarda Lymph; in other words it is supposedly genetic and not due to the surgery; I don’t and haven’t had cancer. I was in a car accident in 2009; which crunched the nerves in my right leg, so I am partially paralyzed now. This does not help me with my weight..at all. I am working presently on trying to find a surgeon who has the ….. to do surgery on my knee and nerve. Amazing how lymph scares those surgeons. Hello…I gave lymphedema what I don’t know is what stage it is right now..thanks very much for the advice I will follow all the rules. As someone who works with cancer survivors the challenge with lymphedema is a constant question. I found your article well researched however it would be useful to add that plant based protein is the most beneficial protein for those who are battling lymphedema. Lord knows, Americans get more than enough protein through meat and dairy. For anyone who is interested in reading about the connection between animal protein and cancer, check out the book “Whole” by Colin Campball. Thank you for the tip on plant-based protein, Faith! I will definitely be looking into that book. I’m very interested as I’m battling lymphedema myself. Thank you for the post! I’m researching a lot in regards to nutrition and protein. I am reading this while having an afternoon snack: a piece of dark chocolate with hazelnuts and a coffee with cream… Not the perfect combo for such a condition as lymphedema, is it? This is my guilty pleasure I still indulge in sometimes – I think I will do a big coffee+chocolate “party” for myself before giving it up, going cold turkey and see how my body reacts to that. One thing I can positively say that it makes a difference: coconut oil. Maybe the main reason for having a coffee right now is not really the pick-me-up effect (I just had a wonderful shower with a longer dry brushing session than normally and feel fresh as a rose bud), but yesterday I got a new jar of coconut oil after taking a 10-day-or-so break from this heavenly smelling, fatty yumminess and now just can’t get enough of it. A teaspoon of coconut oil in my coffee – ahhh! I can’t say for sure that it makes coffee a health drink but through the chock full of benefits coconut oil has, I chose to afford the black brew from time to time. One addition or suggestion for correction for this article would be about fats: it says “include only a minimum amount of fat” but there are huge differences between fat and fat! Coconut oil, for one, is one of the healthiest thing on earth you can put into your body and it will not only not make the burden on your lymph system worse but will help you to eliminate debris that clog it up. Another point where opinions and experiences can differ is the question of salt. Again: not every salt equals salt equals salt. The qualities, the properties and so the effects on our bodies of various salts are astonishingly different. The white, refined crystal which is sold as table salt, can’t be mentioned on the same day as a few other types of salts with rich mineral content and which are in fact essential for the body: for example Himalayan pink or black salt, Celtic salt and one or two others. Drinking lots of water without the proportionally right amount of salt will throw the body fluids out of balance. Recently I am more conscious of how much water I drink and to each cup of water I put a pinch of pink Himalayan salt – it doesn’t change the taste much but MY LEGS LOVE IT! On the days when I do have the proper amount of water with that pinch of salt, my legs behave much better, and on the days when for some reason I am behind with the water intake and my legs get heavier, I remember to drink my salty water and my legs will be grateful for it immediately. Overall, this article is great summary of what should one eat, and these two points would be my addition, I highly recommend to try them. One more thing. Actually, I have so good experiences with these two nutritional items: coconut oil and pink Himalayan salt that for whatever reason I ever got into the situation of having to survive without any food for a week or two, I would make sure I have access to water and have enough of these two with me. I incurred lymphedema , secondary, post cancer surgery/lymph node removal. This plan I’m on has helped me NOTICEABLY- I have always avoided eating animals but eat salmon and Argentinian fresh caught shrimp. I have a pea/rice protein shake in am, with blueberries and almond milk. At lunch I have a big salad, radishes, romaine, onions, peppers, olive oil and vinegar, and 3-6 oz salmon, dinner, broccoli, raw cashews, shrimp. I grill the shrimp and broccoli. As a snack, I have raw broccoli or celery dipped in hummus. I drink water and lemon all day-in 4-5 days, my stomach and bad leg are back to normal, and my stomach is FLAT. I am 120 lbs, and have always taken care of myself, but the lymphedema bloat was unmanageable until I cut out dairy, alcohol, and sugar. I lighten up Friday night and Saturday-pretty strict Sunday-Friday afternoon. I also do yoga, and dry brush a few times a week, since I cannot dance, or jog like I did before. I walk ALOT, 20 miles per week, give or take a mile. Good Luck! Hi There, I have primary Lymphoedemia in both Lower legs since the age of 11. Im now 45 and have dedicated my life to trying to control My Lymphoedema. Diet and body weight is a huge part of our disease and i have Systematically isolated foods to try and discover the magic bullet in regards to reduction of swelling. The best results i ever had was on a 27 day water fast! Yes, yes, way too extreme but it led to an interesting conclusion. All food,all drink will negatively affect your swelling if consumed in such a way it over loads your Lymphatic system. Smaller meals, less consumption equals less swelling. I trialed this on myself and my Mother who also has Primary in both legs. I am currently writing a paper on all my findings and tests i have done over a 30 year period and will let you guys know when its completed. Great site, keep up the good work. Stevie , Byron Bay Australia. so can you please share the results with us? Enjoying comments and wondering if Lymphedema is what I have. For about 1 -1/2, I have been experiencing feelings of swelling, heaviness and tightness in my arms,hands, legs and feet. So, much so that it causes pain at night to lay too long on one side and have to switch because it hurts. I have not been diagnosed with :Lymphedema but after my doctor has done diabetes, nerve testing, and other tests, I think she is now resorting to sending me to a Lymphedema clinic. I mentioned to her that I had a Thermography test that revealed my Lymphatic system was blocked. Of course, she told me that she has never heard of it. So, she started what any other doctor would do and start testing. Now , we are to the point where she thinks it just might be Lymphedema. I go back to see her next week so, Hopefully, she will send me to the Lymphedema clinic to get diagnosed. I just want to know what it is I have so I can get started with treatment. Also, it seems like something as small as bumping my toe hurts really bad. Any pain inflicted now seems like the intensity is 100 times worse. Is that another symptom? Any comments welcomed! I actually can tell you that I have greatly benefitted from eating a very specific plant-based diet and it’s been wonderful. My protein levels have remained healthy as has my calcium.It has greatly reduced inflammation. Since you wrote this article there are more and more of us eating plant-based (no oil, whole foods). If you wish, please message me. I have a blog on here called The Unlikely “No Meat Please” Gal. The photos show everything and give details. I’m interested-I have a clean, no meat diet with tons of veg, but I avoid dairy, and if I’m consistent, it works. I’m post secondary from cancer surgery.